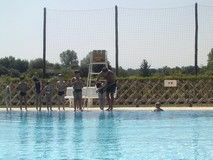 The whole family can enjoy the swimming pool of ‘Luys’ in Amou. Located next to the 2 star campsite ‘2* Camping de la Digue’ and open in June, July and August in the afternoons. This outside swimming pool is also heated and a paddling pool is available for kids. 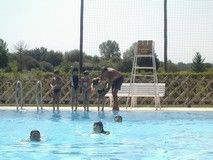 Pascal, the lifeguard, offers swimming lessons for kids of 6 years and over, together with aqua gym sessions. Drinks and ice creams are also available on a site that is secured, so that the whole family can swim safely.